This study develops two deployment scenarios for the EU based on detailed bottom up assumptions on the number of technology developers, plant development timelines, plant capacity, utilisation rates, the rate at which new projects can be initiated, and takes into consideration the availability of project finance. 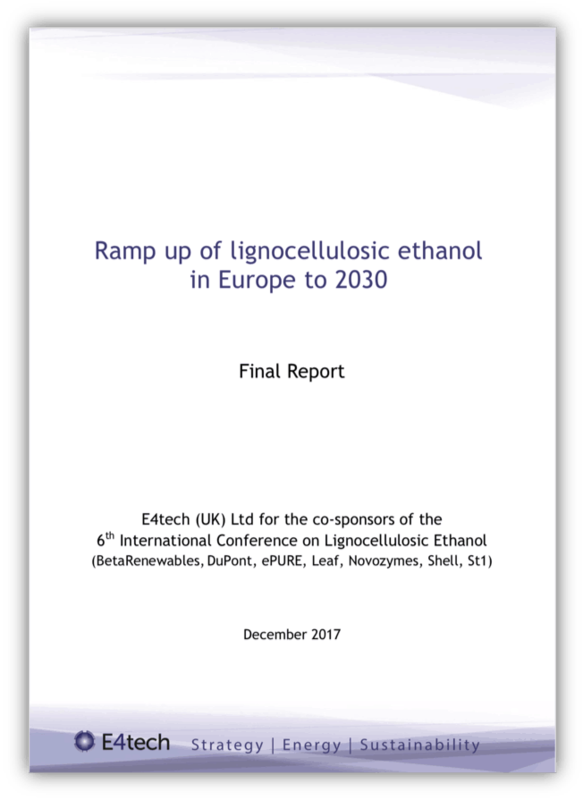 It also considers at what cost cellulosic ethanol could be produced.The report, drawn up by UK-based E4tech, was commissioned by the sponsors of the the 6th International Conference on Lignocellulosic Ethanol (Beta Renewables, DuPont, ePURE, Leaf, Novozymes, Shell, St1) that took place September 2017. From the executive summary: “The cellulosic ethanol industry is at a critical development stage; there are technology developers who are taking stock of the lessons learnt during the development of their first plants, and several more are constructing or planning their first plant. In June 2018 the European Council, European Parliament and the European Commission agreed on the Renewable Energy Directive for the periode 2021-2030, which includes am minimum target of 3,5%. for all advanced biofuels, including lignocellulosic ethanol, in road and rail transport energy in 2030. This makes it a pertinent time to consider where the European industry is today and where it could be in 2030.